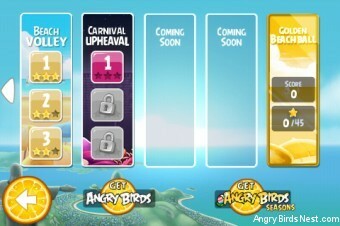 This is a just a quick announcement that a new update for Angry Birds Rio Free (v1.2.0) is now available. This update allows you to unlock the Golden Beachball episode by hitting the secret spot located in Beach Volley level 3-2. For complete instructions and a walkthrough video on how to unlock the levels please check this post. Don’t forget to check out the Angry Birds Rio Free leaderboard and the Golden Beachball walkthroughs. About time. My dad has an iPhone and he has Angry Birds Rio and would love this. Thabks for the update! Where do I get this for android? This scaled down version isn’t available for Android. It’s basically a teaser for iOS users. For Android there is a “free” full version that is ad-supported. It is available in the Android Marketplace. The “ad free” version is available via the Amazon Appstore. Quick elaboration. The Scaled-down, “—Free” apps actually are available for Android via the Amazon AppStore. But I don’t think it is commonly used since the full ad-supported version is already free on Market. But if you really really want it, you can find them on Amazon. Ah, yes the confusion between “Free” and “ad-free” will last forever! That said, I only see Angry Birds Free and Seasons Free on Amazon, not Rio Free. 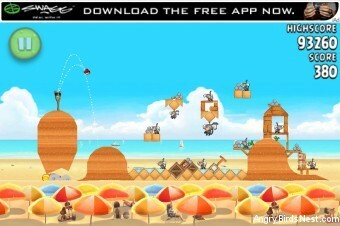 Here’s a link to the Angry Birds App page. what so now people who paid nothing have access to the bonus levels but us who paid $5 for it on PC have to go out and pay $15 to get the new levels? We are only conveying information. We are not aware of Rovio or Fox’s reasoning, but we agree it is confusing. Once you’ve used the code from the movie can it be used again on another computer? They say you can’t, but I haven’t tried myself. Once you get the Golden Beachball it won’t come up again. It will unlock the levels though. Go back to the episode selection screen and swipe to the left. My family and can not get the beach ball to even show up. We shot the bird up and it rolled where it needed to and the ball never showed up? Any suggestions? What device are you playing on, which app (ie, is it the full app or the trial, 9 level version), and what version (click the i in the bottom left of the home page)? No, I don’t believe Rio Free edition is available for Ovi. oof! so frustrating my beach ball is gone and cant get the Golden Beach ball levels (android) shows I got it went back to the episode selection screen and swiped to the left nothing shows? Perhaps close the app and try again. It should appear as the “seventh” episode, at the far right after the two blank episode slots that say, “Coming Soon”. If you’re 100% sure the episode is not there (it usually is) it’s likely because you didn’t actually hit the beachball. It needs to pop up and you need to hit it. Thank You so much! Would have never known if not for angrybirdsnest! You all are the best & I’m at triple digits in game center (if even for a short while)! So what’s the deal with the 17/15 golden watermelons? Do we get 2 points for the beach ball? According to the bug, you get 1 watermelon for causing the beachball to drop from its “hiding spot”, and 1 more for popping it. thank you! your instruction is much much clearer than the DVD instruction. Please don’t write in all caps — we don’t like to be yelled at. 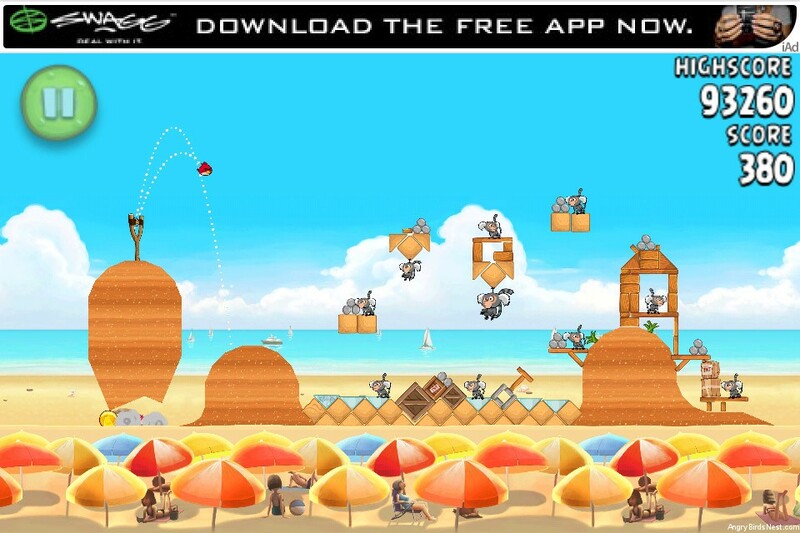 The Mighty Eagle is an in-app purchase currently available for iOS and T-Mobile Android devices. You can learn more about him here. why the levels only smugglers Den and Jungle escape in andorid ? You need to update your app.